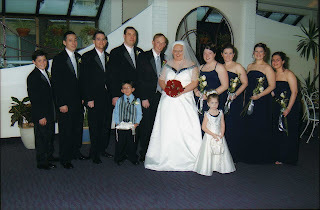 Today Huib and I celebrate our 6th wedding anniversary. I feel as though I’ve written everything possible about our wedding and can’t really think of anything new to add, so I thought I’d share six pieces of advice that have made our relationship work. I’ll tell you now, our relationship is not perfect by any means, but these are some of the most important pieces of advice we were ever given. 3. Never let a problem become to big to handle. 4. It’s not always necessary to be right. It’s okay to compromise. 5. Make sure to take time to just enjoy one another’s company. 6. Dinner doesn’t have to be on the table when you get home from work. We live in a time of shared responsibilities. LOL, I made up the last one because some of the other pieces of advice we were offered aren’t really PG. but in all seriousness, the other five I listed were given to us by some pretty amazing couples, so hopefully by following them we can be just as wonderful. The past six years have been wonderful beyond my wildest dreams, so I can’t wait to see what the future has in store. Huib, I know you don’t read this blog often, but thank you for asking me to be your wife and thank you for continuing to provide me with never ending love and support.